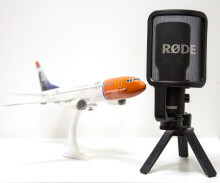 Norwegian, has launched the world’s first female-driven in-flight entertainment comedy channel in an exclusive partnership with the online comedy platform PYPO, Put Your Pretty On. This is the first of many exciting milestones that will come from this partnership throughout this year. 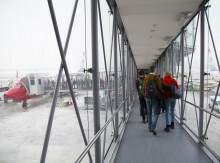 Norwegian carried more than 2.3 million passengers in February, an increase of 11 percent compared to the same month previous year. The increase is primarily driven by intercontinental expansion. 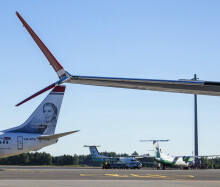 Norwegian CEO: "The UK will be at the heart of our continued global expansion"
Norwegian is today continuing its Irish expansion by doubling the number of flights on its popular Dublin-New York service which will allow for day trips to New York State. ​Norwegian, the World’s Best Low-Cost Long-Haul Airline and Airline of the Year 2017, today took delivery of its 100th direct buy Boeing 737-800 aircraft, the last of this aircraft type in its fleet. Norwegian today reported its full year and fourth quarter 2017 results. The net loss was -299 million NOK (-£27.4 million) in 2017, while the earnings before interest, taxes and depreciations (EBITDA) was 60 million NOK (£5.5 million). 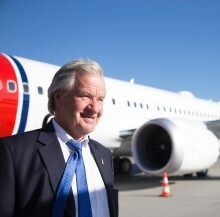 Norwegian CEO Bjorn Kjos today delivered an address in London to outline his global expansion plans for the world's best low-cost long-haul airline, as the UK grows to become one of the carrier's most important markets. 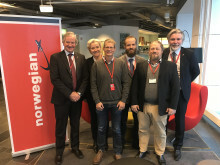 ​Norwegian and Spanish pilot union SEPLA today signed a comprehensive collective bargaining agreement (CBA). The CBA will be valid for two years and represents an important step forward in one of the company’s most important markets. Earlier this week, Norwegian also signed a CBA for its long-haul crews based in Italy. 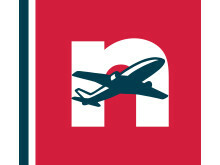 The low-fare airline Norwegian Air Argentina (NAA) received today the Air Services Operator Certificate (AOC) from the National Government. ​​Norwegian will release the fourth quarter results Thursday 15 February 2018. The report will be made available at 7:00 AM (CET) at norwegian.com and newsweb.no. 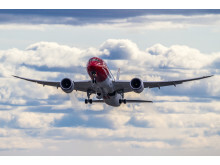 Low-cost airline Norwegian has set a new record time for the fastest ever transatlantic flight by a subsonic aircraft this week using its Boeing 787-9 Dreamliner aircraft.